Many bacteria have been shown to cause community-acquired pneumonia, but researchers and clinicians identify several bacterial species as the most common causes of the disease. However, epidemiological studies investigating the etiology of the disease show that in the majority of cases, pathogen identification is not readily attainable. Pathogens are classified as typical or atypical based on the spectrum of symptoms associated with them (described in the preceding section). In most studies, five pathogens (discussed in the following sections) have been found to account for approximately 90% of all community-acquired pneumonia. 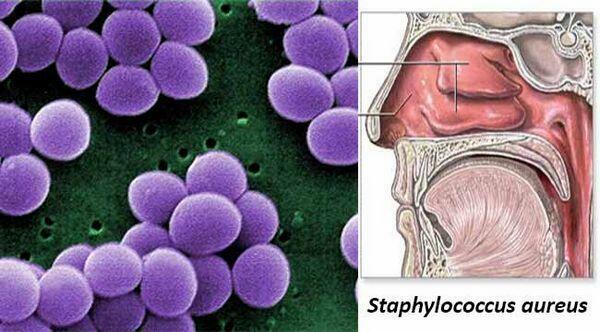 Streptococcus pneumoniae is the bacterium most commonly implicated in community-acquired pneumonia, followed by other frequently isolated, typical etiologic agents such as Haemophilus influenzae and Staphylococcus aureus. In recent years, however, atypical respiratory pathogens have been observed with increasing frequency in community-acquired pneumonia patients; the pathogens most often implicated are Mycoplasma pneumoniae, Chlamydia pneumoniae, and Legionella species. Other pathogens implicated in community-acquired pneumonia include the respiratory viruses (influenza A and B, parainfluenza viruses, and respiratory syncytial virus) and anaerobes, which tend to occur in alcoholic patients. Less common etiologies include Chlamydia psittaci and Coxiella burnetii. Atypical pathogens tend to be a more common cause of community-acquired pneumonia in younger patients and are generally associated with a less severe pneumonia. However, they can affect all age-groups and cause severe disease (especially in the immunosuppressed) as well as mild-to-moderate illness. The pathogens discussed in this section are some of the most commonly reported causes of bacterial community-acquired pneumonia in the major pharmaceutical markets. Table 1 summarizes the prevalence of each of these pathogens in community-acquired pneumonia and the types of pneumonia they cause. The bacterial pathogens are classified as "gram-positive" or "gram-negative" based on their response to a staining technique called Gram's stain. Gram's stain distinguishes bacteria based on differences in physiological and structural properties of the cell wall, specifically its ability to retain the crystal violet dye used in the staining procedure. Bacteria that retain the stain are classified as gram-positive; bacteria that do not retain the stain are classified as gram-negative. The distinction between gram-positive and gram-negative bacteria is important because gram-positive bacteria are generally more sensitive than gram-negative bacteria to growth inhibition by antibiotics that target cell-wall synthesis and to attack by phagocytosis. a Frequency indicates the percentage of patients diagnosed with community-acquired pneumonia (community-acquired pneumonia) caused by the individual pathogen in a series of epidemiological studies. The following sections highlight some of the more important aspects of disease associated with each pathogen. H. influenzae, a gram-negative bacterium, can cause either lobar or bronchopneumonia (see "Classification of Pneumonia") and is usually associated with typical pneumonia symptoms. This pneumonia is often marked by the sudden onset of pleuritic chest pain, possibly preceded by rhinitis. In rare cases, necrosis of the lung tissue with eventual abscess formation can occur with this type of pneumonia and result in scarring. H. influenzae is a commensal organism in the upper respiratory tract; it tends to cause infection most commonly when it invades the lower respiratory tract of patients with underlying respiratory illness, such as chronic obstructive pulmonary disease. Since the 1970s, H. influenzae resistance to β-lactam antibiotics such as amoxicillin and ampicillin has been on the rise. H. influenzae resistance is mediated primarily through production of the enzyme β-lactam ase, which inactivates certain β-lactam antimicrobials, including amoxicillin and ampicillin. In the United States, 30-40% of, influenzae isolates produce β-lactamase. Risk factors for the development of amoxicillin-resistant infection with H. influenzae include recent hospitalization and outpatient prescription of β-lactam antibiotics within the previous three months. Pneumonia resulting from M. pneumoniae is usually a bronchopneumonia that presents atypically; nonspecific symptoms such as headache, myalgia, and malaise occur in up to 70% of patients. Pneumonia with rash can occur with M. pneumoniae. The onset of this pneumonia is gradual, with a prominent cough. Mycoplasma species have a three-layered cell membrane but no true cell wall; for that reason, they do not retain color well with Gram's stain (although the bacteria will show gram-negative staining). Furthermore, antibiotics targeted at the bacterial cell wall (e.g., β-lactams) are not effective against these bacteria. Like S. pneumoniae, M. pneumoniae is frequently carried in the nasopharynx of healthy persons. C. pneumoniae is an intracellular, gram-negative pathogen that typically causes an interstitial pneumonia. It presents as an atypical pneumonia, and symptoms are frequently mild and nonspecific, such as fever and cough. Unlike many other bacterial species, C. pneumoniae does not contain a peptidoglycan layer within its cell wall, which is the target for the β-lactam antibiotics. Therefore, these drugs are ineffective against this organism. 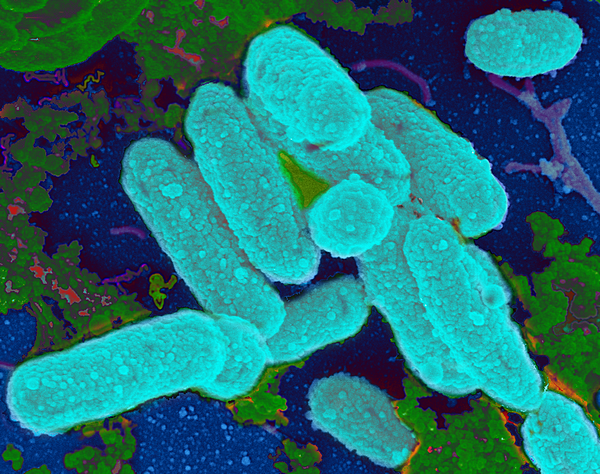 Researchers have identified more than 40 species in the Legionellaceae family and more than 60 serogroups. 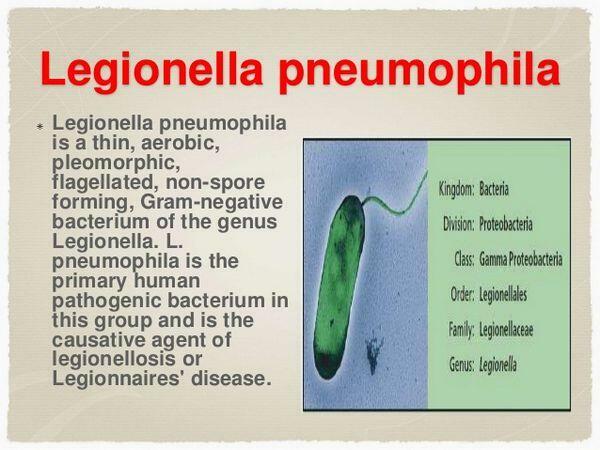 Several species can cause disease, but L. pneumophila is the most common cause of pneumonia. The infection is also known as Legionnaire's disease because it was first recognized during an outbreak among attendees of an American Legion convention. This gram-negative bacterium can cause either lobar pneumonia or bronchopneumonia and is usually associated with atypical symptoms. Upper respiratory tract symptoms are not very common; typically, fever and minimal cough are present. In 25-50% of patients, L. pneumophila pneumonia is accompanied by gastrointestinal symptoms such as anorexia, nausea, and vomiting. Pneumonia caused by L. pneumophila can be particularly severe compared with pneumonia caused by the other common pathogens: some outbreaks have a mortality rate exceeding 60%. L. pneumophila is spread by inhalation of infected, water-borne aerosols and is frequently associated with contaminated water systems, such as air conditioners and cooling towers. Because it is an intracellular pathogen that replicates within macrophages and monocytes, the cell-mediated immune response is particularly important in clearing this infection. Gram-negative bacilli, common commensal organisms in the gastrointestinal tract, can cause pulmonary disease when aspirated into the respiratory tract. Conditions that compromise the cough and gag reflexes, such as alcoholism and diabetes, increase the likelihood of aspiration and are risk factors for development of Gram-negative bacilli pneumonia. The most common pneumonia-causing pathogen in this group is Klebsiella pneumoniae, which causes lobar pneumonia that is frequently characterized by chest pain, sudden fever, and bloody sputum. Disease is often severe and aggressive, marked by necrosis and abscess formation and significant consolidation on X ray. 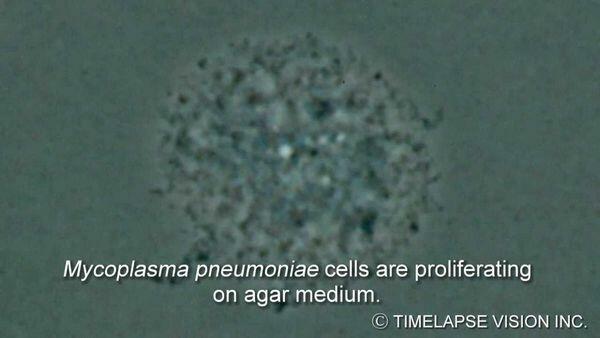 Pseudomonas aeruginosa, also a Gram-negative bacilli, rarely causes community-acquired pneumonia but is notable because it is often difficult to treat, owing to its resistance to many antibiotics. Community-acquired pneumonia caused by S. aureus is uncommon (in contrast to hospital-acquired, or nosocomial, pneumonia), but failure to suspect S. aureus infection and delays in appropriate therapy can be fatal. Although 15-30% of adults are nasal carriers of this gram-positive bacterium, resultant community-acquired pneumonia is rare and presumably requires an underlying host defect. Indeed, community-acquired pneumonia associated with S. aureus typically occurs as a secondary infection to influenza or viral pneumonia or in patients with focal infections that spread through the bloodstream (e.g., secondary to endocarditis [infection of the heart valves]). Staphylococcal pneumonia is often associated with pleural effusions, and lung abscesses develop in 25% of patients. Typical symptoms include sudden onset of pleuritic chest pain, fever, and cough. This bacterium is often associated with severe pneumonia and a high incidence of complications, especially in patients with compromised immune systems (e.g., neonates, the elderly). Although bacteria cause the vast majority of adult cases of community-acquired pneumonia, pneumonia in infancy and childhood is frequently viral in origin. In fact, in patients younger than five years old, the majority of cases of community-acquired pneumonia are viral. The most common etiologic agents are respiratory syncytial virus (RSV), parainfluenza virus, influenza virus, and adenovirus. Children frequently present with upper respiratory symptoms such as rhinorrhea (runny nose) or pharyngitis (sore throat) prior to developing a cough. Because it is very difficult to differentiate viral from bacterial infections, physicians treat most infections with antibacterial agents.